Gray catbird, photographed att Tall Cypress Natural Area, Coral Springs, Broward County, in February 2014. Catbird? Yes, really. The odd name comes from the mewing-like sound the gray catbird, Dumetella carolinensis, makes. It is slate gray, with a black cap and tail, and reddish hind quarters. They're common birds, but you're more likely to hear one, either rustling through foliage, or its singing its distinctive cat-like song, before you actually see one. Gray catbirds spend the summer in breeding grounds as far north as British Columbia and Nova Scotia, south into parts of Arizona, eastward to the Atlantic coast. In winter, they'll seek refuge along the coast and in warmer climes as far south as Central America. A few gray catbirds spend summers breeding along Florida's northern tier of counties, particularly in the northeastern part of the state; nests have been found as far south as Highlands and Sarasota counties, according to a Florida Fish and Wildlife Conservation Commission report. 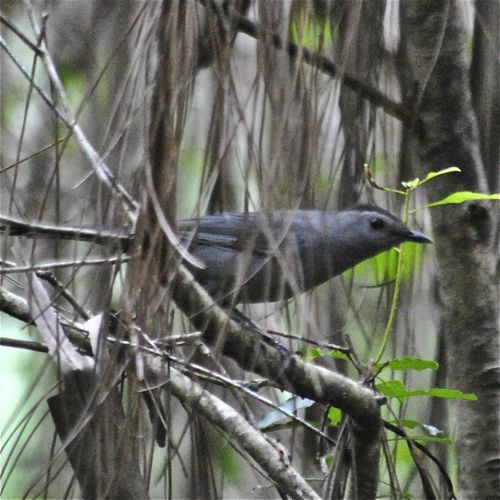 Some nonbreeding catbirds also will spend the summer in Florida. 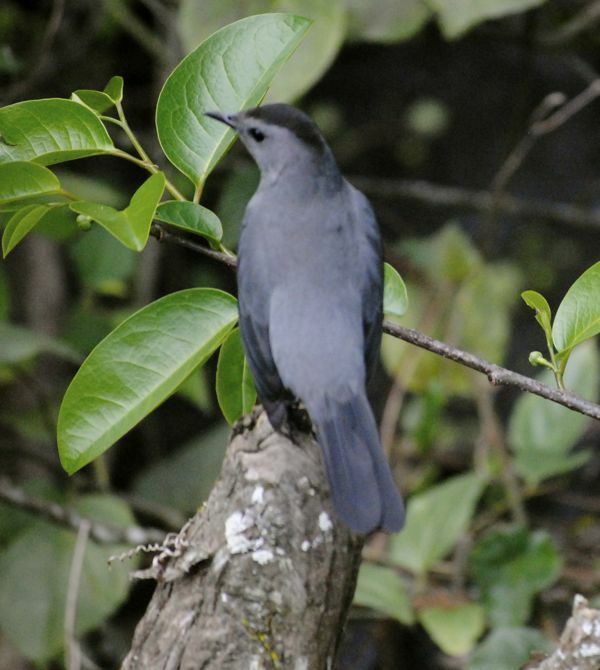 The menu for gray catbirds includes spiders and various insects, like ants, beetles and grasshoppers. They will also dine on a variety of berries, including poison ivy. Yes, poison ivy berries. They are small birds, about eight or nine inches long, with a wingspan of about a foot. They are denizens of the thickets, and often stay low to the ground. We've seen them, heard them first, rustling through leaves and branches so low that it seemed more likely to be a ground animal — a raccoon, a squirrel, a lizard — making the noise rather than a bird. Catbirds typically have two, sometimes three broods per season. Females do the nest building; males sometimes supply the material. The nest itself is a rough cup made of twigs, bark and mud, with a softer lining of grass, rootlets, hair etc. Nest sites are thickets, dense young saplings and trees about four or feet off the ground. Females lay clutches of one to six eggs, typically four, which take about two weeks to hatch. Incubation duties are handled by the mother. Dad, however, brings grub to mom while she sits; he'll also help feed the young. Baby catbirds are fast growers, able to leave the nest in only 10 or 11 days. The young become sexually mature at a year. Some catbird couples remain together for years, while others raise a brood, then split. Males, however, will remain within their territory after the breakup. Fact is catbirds are extremely territorial. Males are the first to arrive in spring to claim their turf. Even in winter when many birds become more tolerant of the presence of others, catbirds, both males and females, continue to defend their bit of the woods against intruders. The gray catbird population is considered stable, overall, growing in some places. Threats to the bird's well-being include coastal development, since most winter near the Gulf and Atlantic shores. Tall buildings also pose threats, since catbirds and nocturnal migrants. Fun Fact: According to the National Audubon Society, this bird used to be known simply as the catbird the name was changed because of an all-black variety in Southern Mexico. Fun Fact No. 2: according to Cornell Labs, the oldest known catbird made it to 17 years, 11 months. However, the average lifespan is about 2.5 years, with the typical maximum 10 years. Gray catbirds are members of Mimidae, the mockingbird family. And yes, the gray catbird shares the family's ability to mimic the songs of other birds. Other names and spellings: grey catbird, common catbird and northern catbird.